Hemingway: To die. Alone. In the rain. Hemingway: To die doing something heroic…even if it was completely meaningless and accomplished nothing. Hemingway: Because he was in love with someone who would never love him back; a fate worse than death. I recently read each of these books as part of my decision to read more non-fiction literature. Tim Keller at one point suggested that pastors, who generally read a lot of non-fiction, ought to also read quality fiction in order to stimulate their creativity and imagination. Some of my favorites have been Tolkien, Dostoyevsky and Steinbeck. With Hemingway, you don’t get happy endings in which everything wraps up perfectly and people live happily ever after. With Hemingway, you get a good story, but most of all, you get a lot of introspection and existential questions, which never get resolved. Perhaps that’s the charm and appeal of Hemingway: he didn’t try to sugarcoat things. He presents life in all of its facets: joy and pain, longing and disappointment. He’s not afraid to leave a dilemma unresolved, or to have a character’s longing go unfulfilled. As I read his stories, I can’t help but feel that Hemingway is writing about himself – and above all, about his inner struggle to find meaning in life apart from God. He longs to be heroic and adventurous, and indeed he was – both in the stories and in real life. Yet in the end, even he himself questions what the meaning of life is – and he is never able to sufficiently answer the question, not even in a way that satisfies himself. In A Farewell to Arms, Hemingway’s character faces the tragic loss of his wife and child, and in a moment of desperation he forfeits his atheism and prays to God! I can’t help but believe that this is Ernest himself admitting that deep down inside, when faced with the reality of life, death and eternity, he knew there was a God – even if he didn’t like to admit it and didn’t want to acknowledge Him. In For Whom the Bell Tolls, Hemingway’s character is fighting on the losing side of a war, in which the deaths of all those around him won’t change a single thing except to cause pain and loss. He tries to convince himself that all that matters is living heroically and all that matters is living for something bigger than yourself… except that too is completely meaningless. So life is a struggle, it is pain and strife – intermixed with some pleasure – followed by death. In The Sun Also Rises, Hemingway’s thesis is that the point of life is to have fun and enjoy yourself – #YOLO, before #YOLO was a thing. The only problem is: what if you fail to attain that which you want, and therefore you do not succeed at enjoying yourself in life? What then is the point of living? It is as if Hemingway, in each of his books, is desperately trying to convince himself that there is meaning in life apart from God – and constantly failing to do so. And yet his life ended in self-inflicted tragedy, as if it was one of his own stories. What Hemingway failed to realize – and tragically so, considering that he asked all the right questions and seemingly came so close – was that all of the disappointment of the unfulfilled longings of this life points to a reality which is outside of this world. This is the hope of the Christian gospel: that the unfulfilled longings we have now will actually be fulfilled one day. That the reason we are unsatisfied with life in this world is because we were made for perfection, and deep down we instinctually know the way that things ought to be – even though it’s not how they are right now. We long for a world in which there is love without parting. We long for a world of adventure and nobility, where love is reciprocated, a world of righteousness where injustice is no more and where life does not end. And the promise of the Bible is that such a world is what we were made for; it has been lost, but it will exist again – and by the grace of God we will get to be part of it because of what Jesus did for us. The knowledge of that gives actual meaning to our present struggles and direction and purpose to our lives here and now – something truly bigger than ourselves, which will result in the fulfillment of our presently unfulfilled longings. For Thanksgiving I took my family to California to visit family and friends. We drove out; it’s a 15-16 hour drive each way, but this afforded me the chance to listen to 3 audiobooks. The first was The Sun Also Rises by Ernest Hemingway. Earlier this year I read A Farewell to Arms and loved it, particularly the ending, and how Hemingway is clearly expressing his own wrestling with faith and belief in God. However, The Sun Also Rises was not like that at all. Besides the detailed account of bull fighting, I didn’t really like the book. 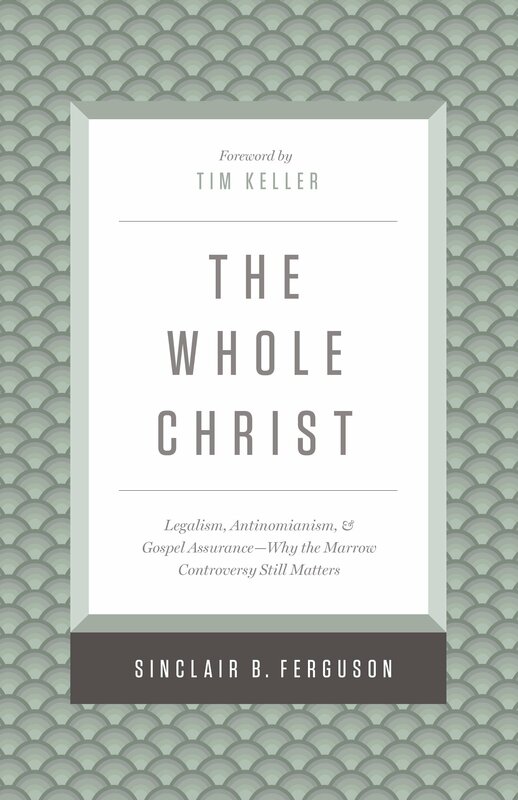 The second book I listened to was The Whole Christ by Sinclair Ferguson, on the topic of the Marrow Controversy, a debate which split the Scottish Presbyterian churches in the 18th Century over the topics of legalism and antinomianism (anti – nomos (law) = against the law). Ferguson points out that legalism and antinomianism are like cousins who are more related to each other than they are to the gospel. The legalist looks to rules and performance to earn status and favor with God. Clearly this is a wrong and unbiblical view. But the other extreme is antinomianism – a rejection, even antagonism towards the Law, i.e. the moral commandments, rules and obligations which the Bible lays out. The thinking behind antinomianism is that the Law served one purpose: to show us that we are sinners who need a Savior, and once that work is done, we have no further use for the Law, and we should have nothing to do with it in our lives, beyond historical reference. It is true that the Law serves to show us that we are sinners who have not lived up to God’s perfect standards, and therefore we need a Savior. Romans and Galatians make this point crystal clear. But is this the only function of the Law in the life of a believer? The answer is: No. So then what is the role of law in the life of a believer – one who has been set free in Christ – beyond just showing us that we are sinners who need a savior? The Law reveals the Glory of God, by showing us His holiness, how He is “other”, different, perfect and good. Where we fall short, He does not. The Law leads us to reverence and worship of a God who is greater than us. This leads us to a posture of humility before God. We ought not look to God’s moral injunctions as the means by which to garner His love or favor, nor as a way of earning or meriting anything from Him. But for the redeemed person, the Law becomes a playbook in our hands, which tells us what God likes and dislikes – and therefore how we, as people who love God, can bring joy and pleasure to His heart. I recently taught a class at White Fields’ School of Ministry on the Minor Prophets. The last book, Malachi, talks a lot about obeying God by keeping His law, and specifically talks twice (in only three chapters) about tithing. The question I asked the students was: What is the role of keeping God’s Law, and specifically of tithing, for the New Testament believer? The answer was that, as people who don’t relate to the Law as a means of earning or meriting anything from God, we approach it as a playbook which instructs us about what God loves and hates, and therefore helps us to respond in love to Him who has poured out His love in our hearts by the Holy Spirit and redeemed us from the pit and set us on a rock in Christ. When we obey His moral instructions and commands, it doesn’t make Him love us more, but it is a way that we can bring Him joy and pleasure.